Mimsy: Google hacked by climategate deniers? This is very strange. 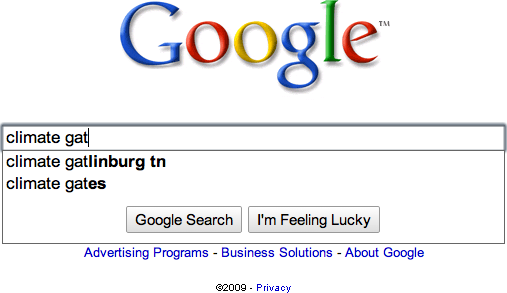 I cannot believe that “climate gatlinburg” is a more common search than “climate gate”. But I also don’t believe that Google is deliberately gaming their search tool to hide the scandal. So what’s up here? Is it possible that the algorithm1 for how they choose what goes in that menu can be gamed from the outside? Bing gets it at “cli”. Yahoo at “climat”. I’m nearly certain that Google was getting it within the first couple of letters when I wrote The (para)psychology of climate change research. I remember wondering whether it should be “climategate” or climate-something else, and going to Google to see what people were using most. It never occurred to me I might need a screenshot of the hints menu, so I can’t be absolutely certain. But the fact that Bing and Yahoo both show climategate in their hints when Google doesn’t indicates something odd is happening. The disappearing hints appeared to start in Google Canada before moving to the main Google.com search page. When Kate from Canada first noted the disappearance, people were still finding Climategate and the other missing hints in the google.com hints menu. This sounds to me like a database issue. Another clue is that “climate gates” is still appearing. Whatever’s causing the various forms of the term “climategate” to disappear didn’t catch that plural. It could be a combination of Bill Gates (or his Gates Foundation) and climate. It might also be a search on the “Climate Auto Gates” company. Whatever it is, the actual search pulls up “climate gate” before anything about Bill, though not before the auto company (because the auto company has both words in the title of its home page). I’ve sent an e-mail to Google asking if they know what’s up. I received a response from Jake Hubert of Google’s Public Affairs department a little after noon today. +1 for responding, -100 for not actually answering the question. Is the hints algorithm being hacked in some way? I'm nearly certain that climategate was showing Thursday morning. I can verify that Google has not removed the query [climategate] or variations of the query from Google Suggest. In fact, [climategate] is already appearing as a suggestion (see attached screen shot). Google Suggest uses a variety of algorithms in order to come up with relevant suggestions while the user is typing. We do remove certain clearly pornographic or hateful or malicious slur terms from Suggest. I suspect it’s a form response answering the question everyone else was asking, rather than the one I asked. I never believed that Google itself removed the variations on climategate, which is why I didn’t ask that question. We know from experience that other aspects of Google can be hacked to provide desired responses, so I thought it might be happening here. It could also be a rogue employee; or it could be that everyone who noticed it is misremembering the term showing up earlier; I doubt the latter. 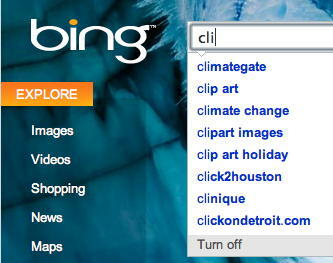 For what it’s worth, I saw climategate return as the top suggestion (after typing “clim”, which wasn’t quite as good as Bing’s “cli”) by quarter to five on Saturday. I was waiting to see if Google was going to respond before posting. It’s too bad there isn’t a wayback machine for trending suggestions on Google and other search engines. That would be interesting to browse back through. Cue Al Gore jokes here. Google hacked by climategate deniers? last modified November 30th, 2009.